Ylläs Ski is among the 5 best rated Ski Resorts in Finland. Season starts on Nov 30 and ends on May 5 (156 days). Average season duration in Finland is 165 days. During the season (from Nov 30 till May 5) the average snow depth at Ylläs Ski is 27 ". Snow coverage is usually best during March, offering an average base depth of 35 ". Therefore Ylläs Ski is among the 3 ski Resorts with best snow conditions in Finland. Ylläs Ski features 39 sunny days on average per season. The average for all ski Resorts in Finland is 43 sunny days. March is the sunniest month with an average of 16 sunny days. This makes the ski resort one of the 15 sunniest in Finland. 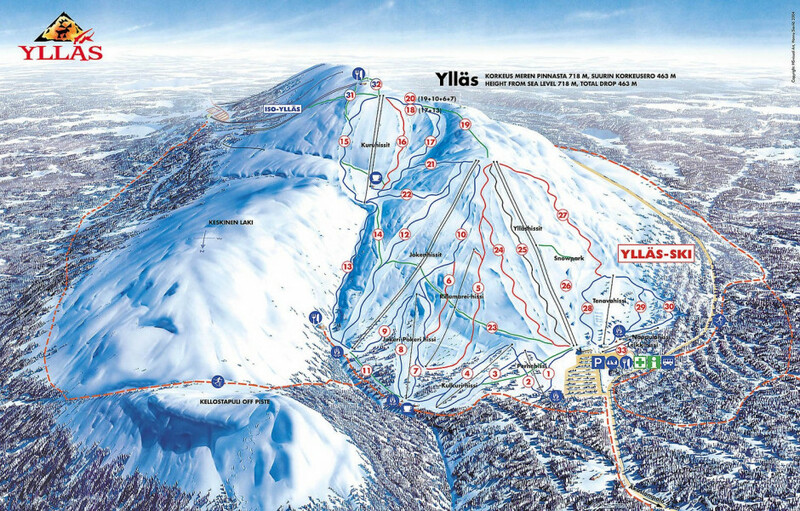 Offering 34 miles of slopes and terrain, Ylläs Ski is the largest ski resort in Finland. The gateway to the wild north is the claim of Ylläs. At least, it is true. The winters are harder and darker, but the northern lights are brighter. Ylläs is one of the most popular in Finland. It has the longest run in Finland, the "Jättipitkä“ with about 3 kilometres. In summary there are 63 runs, 29 lifts and 11 lodges. You can also experience the original flair of Lapland here: with huskies and dogsledging, reindeers, ice swimming and sauna.